Subscription boxes are ridiculously popular right now. You can get them for baby, beauty—even shoes! But the new subscription box from GlobeIn does more than just save you money and score a special surprise delivered each month. GlobeIn’s Artisan Box supports fair trade projects around the globe. Want in? I’m giving away a free box to three lucky winners! Each month, GlobeIn delivers a themed collection of artisan-made products from around the world. Get 25% off or win an Artisan Box, free! Each month, GlobeIn delivers “the globe in a box,” a themed collection of artisan-made products from around the world. The boxes include handmade and fair trade products sourced directly from non-profits, collectives and other organizations that ensure a fair wage is paid to artisans and farmers. These products aren’t made in factories—they’re handcrafted by individuals. Subscription to the GlobeIn Artisan Box is $35 per month, including shipping; each box delivers between five and seven items and spotlights a different theme. For example, the March box focuses on artisan products, and includes an organic cotton market bag from India, a beautiful upcycled coconut shell bowl from Vietnam, mineral-rich rice from Indonesia, lip balm made from wild-harvested Brazil nut oil and cacao nibs from Colombia, all packaged in a colorful woven palm leaf basket from Mexico. Great value, right? Want to try? Use “GREENEST” to get 25% off one the first month’s GlobeIn Artisan Box for yourself—or a beautiful gift for a friend. Then enter to win one of THREE boxes that we’re giving away! This post was sponsored by GlobeIn and meets the standards I’ve established to endorse a brand as “Mommy Greenest Approved.” Click here for more about Editorial Standards. I’ve tried a couple of subscription boxes for food (Hello Fresh and Nature Box). Both are really good. I’ve never subscribed to a monthly box. I have tried subscription boxes and they are great for trying new products without paying full price. I tried Conscious Box, but found that for Vegan and Vegetarian options you got a lot of the same items over and over … I think I got like 20 packets of honey between two boxes. Would love to try the Globein box. I buy fair trade when possible. This is absolutely cool! Would love to win it. Health and peace. No, I haven’t tried any. Yes, fair trade is important when purchasing items! I’ve tried a local weekly produce box and a monthly craft box for my grandson (Kiwi Crate) but that’s all. I’d love to branch out. I do buy fair trade whenever I can. I love monthly boxes! I subscribe to quite a few. I love trying new products! i have yet to try a subscription box but they seem really fun! i like buying fair trade when i can. I’ve never tried Fair Trade products but would love to! I used to subscribe to Love with Food & Ipsy..loved both! I like subscription boxes. I especially like them when you can trial them for a short period. It allows me to see if there are new products I like and haven’t heard of, and if there is a box service I could use. Some have been complete wastes, so I’m happy to use them for a month and be done. I’d be happy to trial this fair trade option! I am doing both conscious box and Love with Food. buy fair trade as much as I can . this would be cool! I haven’t jumped on the subscription box train. But I do like to buy fair-trade. Stores like Globein and Ten Thousand Villages are always my first stop for holiday and other gift shopping! I haven’t tried subscription boxes, but these sound great and I love buying Fair Trade products. ABSOLUTELY, I LOVE THEM AND I ONLY CHOOSE FAIR TRADE!! I haven’t actually tried one yet but I have been doing lots of research because I’m trying to decide which one to try out!! FAIR TRADE-ABSOLUTELY!! I try to buy fair trade as much as possible- and I’m looking at some subscription boxes to purchase right now! I did Sparkbox Toys for a while for my little person. I loved getting higher quality toys that I then sent back! It was sort of a combo of a subscription box and Netflix, except for toys. Thanks for sharing this one–so neat! I haven’t seen that, will look for it! Have not tried a subscription box, but I do buy Fair Trade as often as possible. I LOVE stuff like this! Not only do you get beautiful, high quality products, you can feel good knowing that no one was harmed during their production! I haven’t tried a subscription box yet (unless you count one with horse merchandise I had as a kid, it was pretty cool). I do love to buy fair trade when I can find it and when I can afford it. This sounds amazing! I was signed up for a few different monthly boxes, but I’m going to cancel all of them for this one. I’m very excited to learn more about GlobeIn – thank you for featuring this great company! I have never had a subscription box but I would love to get them. I definitely want to be buying more fair trade products. I’ve tried several subscription boxes, including Conscious Box, Eco Emi, Vegan Cuts, and Petit Vour. I had to cancel them, due to financial restrictions, but Vegan Cuts and Petit Vour were my favs! : ) and yes, I but trade whenever possible, especially with coffee and chocolate ! I have tried a couple different subscription boxes but they were all food related. This sounds great and I love fair trade products! I currently subscribe to PopSugar. I received a free sample of Nature Box I believe. I wasn’t that impressed, but I do like the idea of subscription boxes, especially GlobeIn. It’s ingenious; I buy fair trade and organic products whenever possible. I have not tried Nature Box, but GlobeIn is awesome 🙂 Thanks for commenting, Christiana! I’ve never done a subscription box and yes, I buy fair trade when possible. I know, right? And such a great deal! 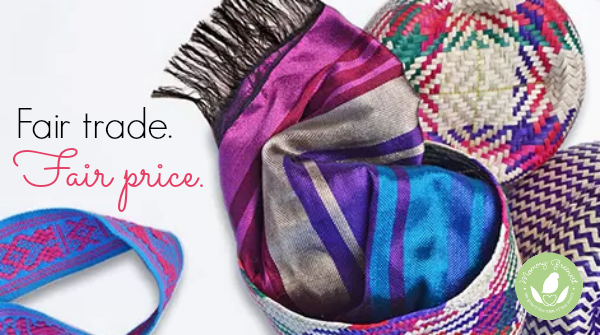 Fair Trade products create a balanced economy worldwide–with great products too! Yes, absolutely. Thanks for sharing, Rosalie! I haven’t! I try to steer away from subscriptions, unless I know I will definitely need something (like fruit and veggies from a local farm). I’ve tried Birchbox, Love With Food (which is all organic and non-GMO!) and an all natural makeup box but cannot for the life of me remember the name. I love subscription boxes because they’re fun little surprises each month!